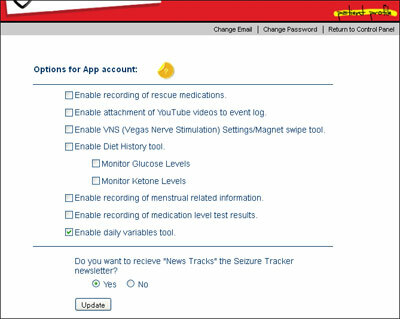 SeizureTracker.com - Compare epilepsy related daily variables to seizure activity. 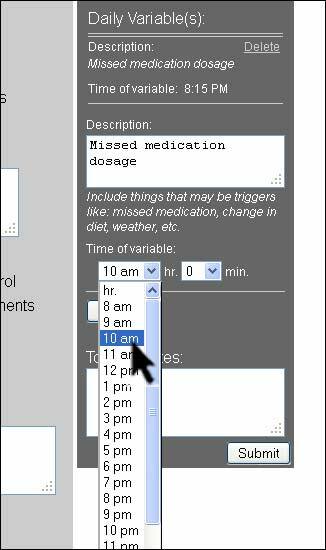 Collect and compare epilepsy related event triggers or "Daily Variables" in your Seizure Tracker account. This tool allows users to record the description of a possible trigger and the time it was recorded. This tool is not incorporated into the seizure event but attached to a daily entry. Things recorded by day (and not event) could include: missed medications, diet irregularities, etc. - Visit the "account settings" page which is accessible from the links section on your control panel. - Select the "Enable daily variables tool." option in the settings list. - Press the update button. The "Daily Variables tool will now be accessible on the right hand side of the event logging page. After a variable is entered into the tool it will appear in a list right above the new entry tool. Multiple entries can be made on a single day and can be remove by clicking the delete button to the right hand side of the variable description. After submitting information into this form a "Daily Variable " mark will be included on the corresponding day in the "By Day" graphs on your Seizure Tracker reports. When rolling over the variable mark with your mouse the time and description will appear. Additional surrounding information will be included in the list portion of the reports. Seizure Tracker users also have the option of including a "Daily Variable" list that would include all entries (and surrounding information) in that particular report period.